In the past few years, U.S. home prices have risen robustly while sales of new homes bumped along at historically low levels. Data released Tuesday may signal a reversal of these trends: a cooling off in prices and a strong uptick in sales. 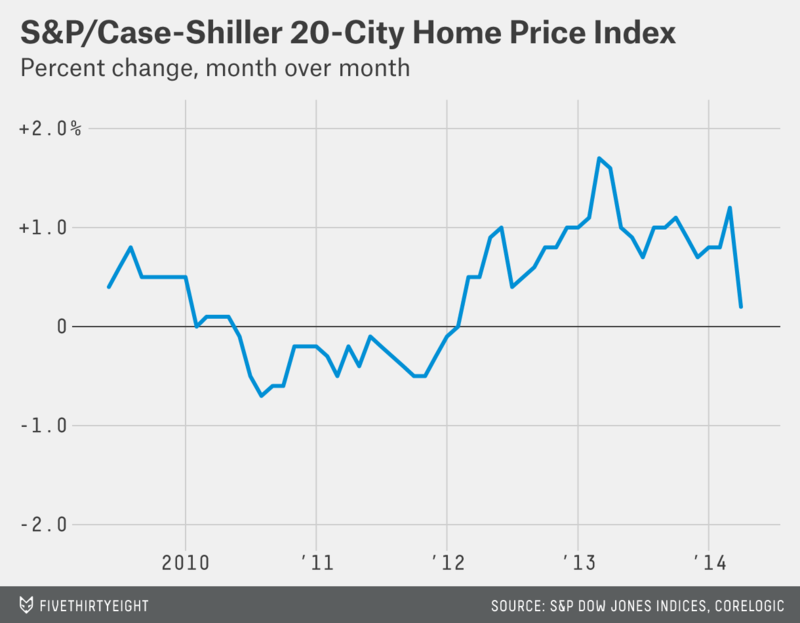 Home prices rose 0.2 percent in April, the smallest monthly increase in more than two years and down from a 1.2 percent increase in March, according to the latest S&P/Case-Shiller 20-City Home Price Composite Index. The index tracks repeat purchases of homes (and therefore excludes new home sales) in 20 large metro areas. Relative to a year ago, home prices are rising at 10.8 percent, down from a pace of nearly 14 percent late last year, and over 12 percent earlier in 2014. 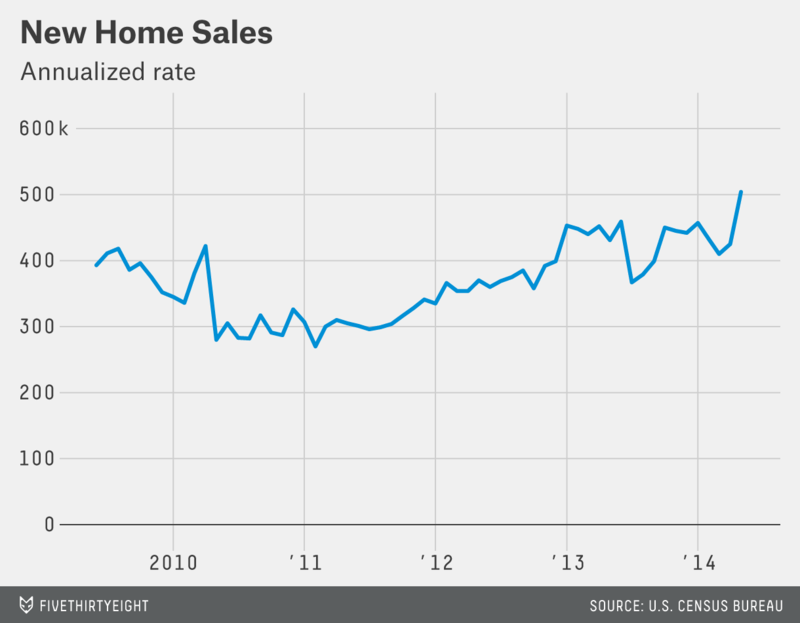 Meanwhile, a Census Bureau report on new home sales showed a spike in May: Sales rose to an annualized rate of over a half-million, the highest level in six years. The rise of 18.6 percent from April levels is the largest monthly increase in more than 20 years. This data comes on the heels of a report on existing home sales Monday, by the National Association of Realtors, that showed a rise of nearly 5 percent in May. Both of these numbers are encouraging in light of the rise in mortgage rates that began last year and made home purchases more costly. Relative to fundamentals, the housing market might be nearing its fair value, according to an update of Trulia’s “Bubble Watch” released Tuesday. By that measure, home prices are still undervalued by 3 percent but expected to reach fair value late this year or early next. But these nationwide numbers mask wildly divergent trends in housing markets across the nation. For example, several California metro areas, led by Orange County, look overvalued by more than 20 percent; while several cities in Ohio, notably Akron and Cleveland, seem undervalued by about 21 percent. So, prices are rising, though at a less bubbly pace; home sales are rising for existing units and booming for new ones; and the overall housing market is just a tad undervalued, though this glosses over huge regional variation. Still, tuesday’s reports might help quell policymakers’ fears that prices were rising at an unsustainable pace and that home sales were hit hard by rising mortgage rates.